SO4992 0514. Standing in a field just off the B4293 Chepstow road just south of Trellech village are three Bronze-Age standing stones, dating from 3,500 years ago, all that is now left of a probable stone row or stone circle. Monmouth is 5 miles to the south and Tintern 3 miles to the north-west. 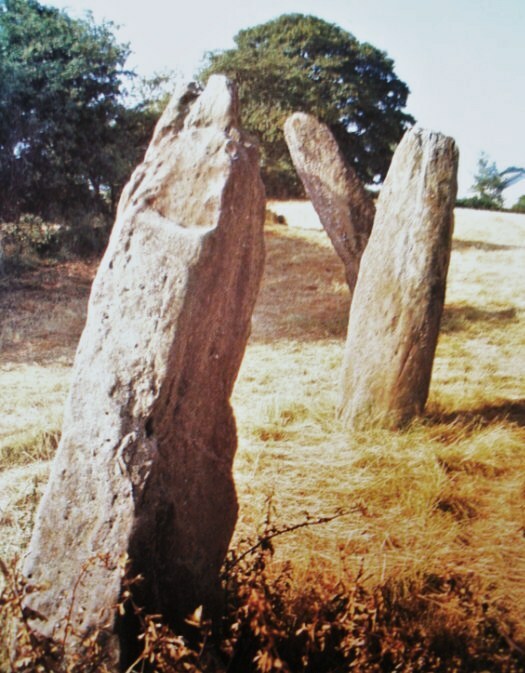 Trellech means ‘the place of the three stones’. The three stones or monoliths lean at different angles to each other and vary in height from 8 feet, 10 feet and almost 13 feet, the tallest stone having sunk into the ground and slipped leaving it at a crazy angle. A fourth standing stone apparently once stood close by but was robbed-away or destroyed in the late 18th century. The stones are made of conglomerate rock that is known as ‘Pudding Stone’. According to legend, the stones were hurled by the giant, Jack o’Kent, from either the Skirrid Fawr (Holy Mountain) 12 miles away to the north-west or, from Beacon Hill, 1 mile to the east, while he was having a fight or playing a game with another giant or, perhaps the devil? King Harold of the English, known as Harold Godwinson, fought a ferocious battle hereabouts with a Welsh army in the 11th century; Harold was victorious although he lost many of his men in the onslaught. He had the stones erected here to commemorate that battle. However, there is no connection whatsoever with King Harold, the stones pre-date him by thousands of years. It is thought likely that religious ceremonies took place here – the stones being phallic symbols, with some magical significance to the ancient druids maybe another line of thinking – though they are not generally thought to be part of a druids’ circle. In the village church of St Nicholas, a 13th century building on a 7th century Saxon site, there is an interesting 17th-century four-sided sundial. Three of the faces show the historic features in the village each with it’s own Latin inscription; the three standing stones are depicted along with the inscription MAIOR SAXIS or ‘greater because of the stones’ and HIC FUIT VICTOR HARALDUS or ‘here Harold was victorious’. On the other faces of the sundial are St Anne’s well or The Virtuous Well, 300 yards along the Llandogo road, was where medieval pilgrims came to receive a miraculous cure, and Tump Terret a 20 foot-high mound in the grounds of Court farm behind the church, that was probably a 12th century motte and bailey castle or a keep that was built by the Norman de Clare family, although local legend says that the mound contains the bodies of King Harold’s men who were killed in the battle. But no excavations have taken place so we shall probably never know it’s real meaning only what can be learned from the locals who know a good tale or two! Categories: Church Of St Nicholas, Four-Sided Sundial, Harold's Stones, Monmouthshire, Standing Stones, Trellech, Tump Terret, Virtuous Well | Tags: Harold's Stones at Trellech in Monmouthshire, Standing Stones | Permalink.